A 23-year-old San Marcos man was arrested Monday in connection with a pair of break-ins at an apartment complex in the 500 block of Rush Drive, in which the suspect entered rooms where young girls were sleeping, San Diego County Sheriff Bill Gore said. Dwayne Farrell was arrested about 2:30 p.m. on suspicion of burglary. Gore said detectives identified the suspect based on the given description and their knowledge of the area, and watched his home — about a half-mile away from the scene. 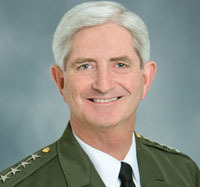 San Diego County Sheriff William D. Gore. Official photo. “He was known to our detectives and our patrol deputies in that area for his past activities,” Gore said. DNA evidence found in blood in one of the apartments led to a positive identification, a search warrant and an arrest warrant, Gore said. The blood likely came from jumping from a second-story balcony in the “brazen” burglary, he said. A DNA match was confirmed about 9 a.m., after investigators worked through the night, Gore said. Farrell’s DNA already was in the local database after prior contact with law enforcement officers, the sheriff said. Farrell is suspected of entering a first-floor apartment through the sliding glass door about 5:15 a.m. Sunday and standing over the bed of a sleeping 7-year-old girl, San Diego sheriff’s officials said. When the suspect noticed that the girl awoke, he allegedly ran out of the apartment through a sliding glass door. He’s suspected in another break-in about 25 minutes later. A woman who was sleeping with her 8-year-old daughter in an apartment on the second floor of the complex heard heavy breathing and found a man beside the bed, sheriff’s officials said. Farrell allegedly escaped again through a sliding glass door, jumping from the second story balcony, sheriff’s officials said. Gore said he did not believe that either girl had been touched, but said resources were being made available for the victims and their families. He advised residents to take precautions with sliding doors, even if they live on a second story. “Where somebody is so brazen to break into a home while people are there, and then enter into the bedrooms of small children — really, it makes you shudder to think what might have happened,” Gore said.